← Is the Paperback Really Dying? Huh crazy, that’s pretty cool! I can explain some of my own reasons for agreeing with JTTR and how I suspect they are his own reasons, but I’m trying to find more critical support. For instance, the Witchking of Angmar vs MacBeth things is that the “not by one of woman born” thing in the latter totally guts (and I would say disrespects) childbearing by reducing it to the delivery method. For JTTR, especially as a philologist, its about the fact that WS totally botches the richness of the word. Being “born” is not just about the delivery method, it is etymologically descended (rather immediately) from “borne” – “born” means to be carried by a woman for 9 months.This goes hand in hand with the problem that WS doesn’t have a clue about how the metaphor of literature works. Meptahpors are riddles (in ancient Hebrew the same word is used for both, mashal). There is the riddle (the image) and the answer (its inner meaning – which becomes the inner meaning of the overall thing as well) – the riddle is arrogance (Angmar seeking secret things like sorcery to secure victory in battle) and the answer is humility (defeated by a woman disguised as a warrior, aided by a halfling … both, in a patriarchal society, symbols of lowliness, and thus humility). On Day’s book. I’m sure you have thoroughly digested it long ago and seen that its not really about LotR (he actually botches a few of those details), but rather using the popularity resurgence accompanying the movies to publish some of his own research in a certain field (ring lore in various mythologies and ancient bodies of literature)… which, to me, having been in academia for a bit, is fine … just wasn’t what I was looking for when I first got the book … but it was a good read anyway. 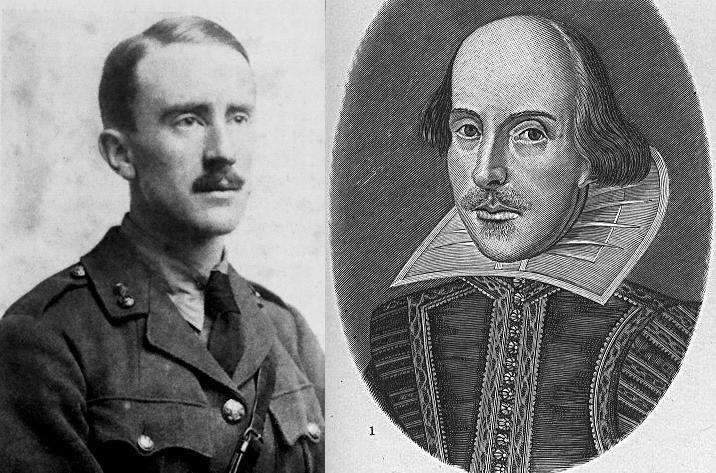 Excellent thought processes on JRR Tolkien and Shakespeare! You’re right, I don’t recall Day’s book being especially academic from my vague remembrance of it. Looking back at this post I don’t recall doing any in-depth research on further sources other than Day’s book, which at the time I was probably reading at the time only for entertainment value anyway. Your ideas as to why Tolkien would’ve thought this way strike me as very plausible, especially the relation to the meaning of the word ‘born’ and the place of riddles in stories. I also think Tolkien would’ve cared very much about those! I should try to track down further evidence behind this story. My blog has been terribly neglected of late due to unforeseen life circumstances, but maybe in the far future I can do a follow-up post on this. And I would be highly interested if you find out anything more as well! I quite like your ideas on Shakespeare and drama too. There’s aspects of Shakespeare I do admire, but I don’t find myself loving him quite as much as some seem to do. As much as I love that scene of Eowyn killing the Wtich-King, I as a linguistically informed Feminist have always been bothered by that treatment of the word “Man”. Because I know full well that Man was originally a completely Gender Neutral word. Woman means a Man with a Womb, meaning all Women are Men but not all Men are women. That is why The Bible uses it of Adam and Enosh, completely gender neutral terms in Hebrew, ye the modern perspective that “Man” is gender specific caused KJV onlier to exclude women from verses never meant to exclude them. But I get around that issue by remembering LOTR is supposed to be hypothetically a Translation from whatever language the Baggins wrote the Red Book in. So I just imagine that whatever word was originally used in the Prophecy was more like the French Masculin, or the Hebrew Zakar. I had heard before of the Trees marching on Helms Deep being partial inspired by Macbeth. But I also thought I’d heard once about a little known Bible verse referring to marching Trees as well. But I can’t recall what it was. Interesting! Thanks. If the Ents are partially inspired by a bible verse, I’d be interested in knowing which verse as well! I did some searching, and it seems the passage in Question was 2 Samuel 18:6-8. The Wood of Ephraim. “The battle spread over the face of all the country, and the forest devoured more people that day than the sword.” Wow, that’s really cool! Thanks for finding that for me! I was never impressed enough with David Day’s book to buy it. The books on Tolkien I do recommend (highly) are the following two by Tom Shippey: “The Road to Middle Earth” (revised edition) and “JRR Tolkien Author of the Century”; and two by Verlyn Flieger: “Splintered Light” (2nd Ed.) and “Interrupted Music”.